Several years ago, growing olive trees seemed mysterious to me. Now, I have been overseeing my own olive farm in Greece with 120 trees for four years and growing olive trees seems much simpler. On my farm, 60 trees are Koroneiki, small trees that produce small olives with relatively large pits, unsuitable for the table but producing high quality oil. 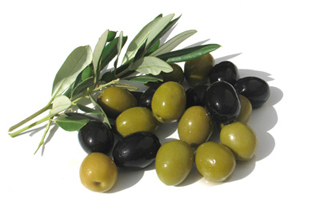 Thirty-eight trees are Athenas, large trees that produce medium-sized olives suitable for either oil or the table. I have two trees that produce olives specifically for the table: one Kalamata and one Chalkidiki, also called Gaidero or “donkey olive.” Kalamata olives are large black olives generally preserved so they remain rather salty. Gaideros are giant green olives, often served stuffed with garlic or almonds or blue cheese. My advice to the backyard gardener would be to choose one of these two varieties or if your yard is large enough, one of each. Processing olives for the table is a labor-intensive job: table olives must be picked by hand. Then before they are put into salt water to preserve them, they must be sorted through to eliminate fly-infested or otherwise damaged fruit. Giant Gaidero olives should be slit on three sides with a paring knife, so that the brine will penetrate the olives. Kalamatas may be slit if you desire, but it’s not imperative. Put the olives in a large jar and fill the jar with water. Raw olives are extremely bitter and inedible. To leech the bitterness out of olives, change the water every 24 hours until the olives are no longer bitter. Then place the olives in saltwater. The level of salt in the water is easy to determine: float a raw egg in its shell in the salt water. You have added enough salt when about one-third of the egg is above water. Remove the egg. Previous post: Will those tomatoes EVER turn red?